An original Rembrandt Van Rijn etching. Signed and dated in the plate upper left Rembrandt f. 1637(faint). A strong 17th century/lifetime impression of Bartsch, Hind, Biorklund-Barnard, and New Hollstein’s only state, Usticke’s first state of two, of this rare etching (characterized by G.W. Nowell-Usticke in his 1967 catalogue Rembrandt’s Etchings: States and Values as “a rare plate, with a handsome portrait” and assigned his scarcity rating of “RR” [50 to 75 impressions extant in that year]). Catalog: Bartsch 313; Hind 150; Biorklund-Barnard 37-B; Usticke 313 i/ii; New Hollstein 163. In 1755 this picture of a man with his left hand resting on a walking stick was described as ‘Het Portretvan een Ouden Patriarch, met een bonten Mantel om den een kostabarre Bonnet op ‘t Hooftd’ (The Portrait of an Old Patriarch with a fur Coat and an expensive Cap on his Head). 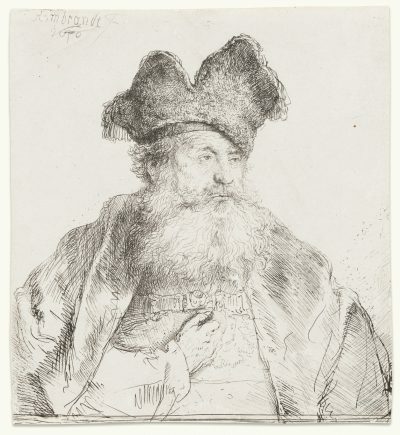 Traditionally the print is classified among the numerous studies of bearded old men that Rembrandt etched, but for a variety of reasons he is the odd man out. For example, almost all of the works in that group were created around 1630-31, whereas this print dates from 1637. What’s more the execution of his face is so specific that in 1909 Jan Six considered it to be a portrait rather than a character head. Who it is meant to be, though, is unclear, and the clothes are certainly unusual. The headdress appears to be a cross between a sixteenth-century scholar’s cap and a beret, which would already have been considered as old-fashioned in the seventeenth century. The clasp fixed to the beret looks exotic.